Reading is one of the most challenging subjects for students to grasp. While some instantly take to decoding, fluency, and comprehension strategies, many others struggle. 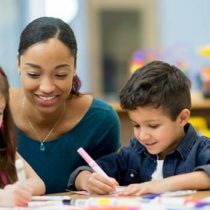 As a teacher, your job is especially challenging, because state testing often places restrictions on what can and cannot be read to a student unless he has specific testing accommodations listed on an IEP. Preparing your students becomes particularly important to help ease the anxiety of the high performers, as well as those who struggle. The three ideas below will give you some quick file folder mini-centers that review basic concepts on most tests. Determining what an author’s purpose is for writing a story is an important concept that your students will be tested on. Create a mini-center by cutting out articles with different purposes from magazines like Highlights or Ranger Rick. Adhere the articles to card stock and laminate them. Test students’ knowledge by having them match the article to its purpose and recording the answer on a sheet to turn in. If your school uses test prep books, copy a few of the samples in them and use those instead of magazine articles. You can also write your own blurbs if you choose. Store this center in a file folder and keep it with other test prep review folders. On one half of a file folder glue an excerpt from a short story or other reading passage. On the other side of the folder, have a pocket with half-sheets of paper that have a story web drawn on them. To complete the activity, students must fill-in the story web based on the passage. For example, one of the web ovals would ask for the main character, another for the setting, etc. Get creative with the cover and draw or glue a picture of spider on the front to indicate that it is a web activity. Not only will your students need to read passages, but for many tests they will also be required to read and understand a table of contents or index. Set aside a couple of text books to give them real-world practice. Create questions for each text book’s table of contents. The answer sheets can be stored inside file folders tucked inside the books. If you would rather not have the books stored with the rest of your activities, simple copy one of the table of contents and glue it to the inside of a file folder. Have the questions in a pocket on the opposite side and the answer sheets on the back. By making test review a center activity, students’ skills will be reinforced while they are having fun. Create a simple smiley face center completion chart where you track who has completed the activities. Once the whole class is finished with the activities, celebrate with an extra recess or a game outdoors. There is nothing like outside time to motivate your students.